Everyone has their own Christmas traditions. Some open gifts on Christmas Eve, many go to Mass on Christmas morning, at our house we also attend to ritual, the Christmas film screening. The decision of what film to choose depends on what is fresh and seems appropriate. I’m still not sure how we ended up in 2007 seeing Will Smith battle hyperactive zombies after a plague, it must simply be timing. Last year we knew all the way back to the summer months that we would see “Les Misérables” on Christmas day. The trailer was the perfect bait for us. 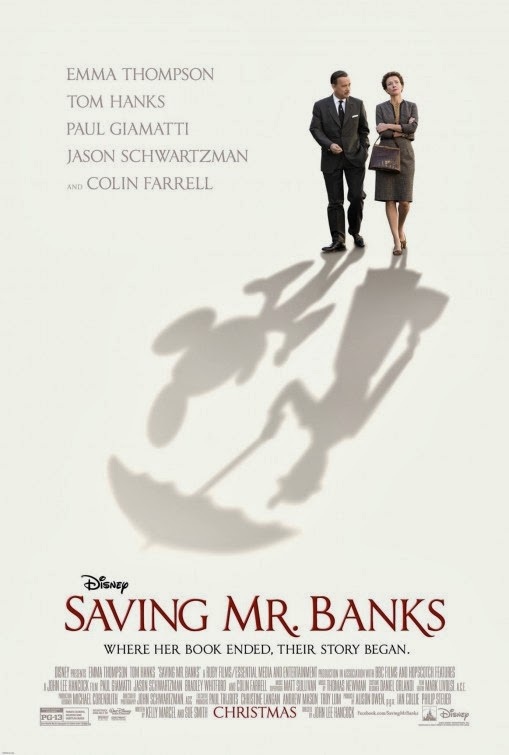 Well this trailer also sold us early on, it is the concept of the film and the stars that made “Saving Mr. Banks” our planned on Christmas film experience since we first heard of it. The story of how Walt Disney convinced a reluctant P.L. Travers to give him the rights to the character of Mary Poppins seems a natural for a family holiday film. Two words, “It is”. There is a bit of a caution warning to begin with. The story does have immense charm and humor, and there are moments of delight, but all of those moments seem more meaningful because around the edges is a dark cloud of family history that is the source of Traver’s reserve. Those moments are at times sad, frightening and they might be bewildering to the very youngest family members. I can’t imagine that anyone will be traumatized, but you should go in forewarned because the back story of P.L. Traver’s family is not ultimately a happy one. The story is told through a series of flashbacks and forwards from 1901 to 1961. Those transitions are made in very effective cinematic techniques that are not subtle and may put off film hipsters that object to heavy handed story telling but they will please traditionalists with the craft in which they are interjected into the story. Emma Thompson plays Travers as a truculent woman who is unable to be appeased by the most logical appeals a professional film story teller might make. She comes off as unpleasant and dour. At first you might be inclined to wonder how it is that this woman is responsible for the marvelous character she has created. It seems that the performance is to be all frowns and facial ticks conveying unhappiness. As the story develops though, it is clear that there is a trans-formative process occurring. She never becomes cuddly but she definitely becomes human. Here there are some obvious Hollywood tools employed, including a tentative friendship with a wise minor character that delivers some positive energy despite the negativity flowering off on Thompson. It helps that this character is played by the talented Paul Giamatti, who can convey patience and kindness with his eyes as well as anyone can. There is also a very obvious moment when a musical breakthrough occurs and it is shown in a extremely conventional way; a way that completely works and should bring a huge smile to your face even if you don’t like being manipulated. It is hard to imagine better casting than Tom Hanks as Walt Disney. Even though his voice and appearance might not automatically make you think of Disney, his warm demeanor and the audiences personal history with him as an actor, create a wonderful shortcut to the man that the film wants us to believe Disney was. There are only a couple of hints dropped at the tough minded businessman he was capable of being, for instance his reluctance to invite Travers to the premiere of her own film, but with the force of nature that Thompson represents Travers as, we need the Uncle Walt image to balance the story. Also in the cast are Jason Schwartzman and B.J. Novak as the Sherman brothers, the genius team behind the song of the Mary Poppins film. Novak gets some laughs for daring to be honest with Mrs. Travers and Schwartzman gets to play the piano and vamp the songs in rehearsal/story meetings. Bradley Whitford is Don DaGradi, the screenwriter who must work with the team to massage the story to Travers liking. Whitford is a personal favorite from his time on “The West Wing”, but he is also a skilled comic actor who helps these scenes work both in their comedy aspects but later in their dramatic moments as well. The director is John Lee Hancock, who did two terrific sports themed films in the last dozen years or so, including directing Sandra Bullock to her Oscar win in “The Blind Side”. It is quite possible he will have overseen another Oscar nominee in Emma Thompson’s Travers. He has effectively used the same sentimental palate that Steven Spielberg uses, including warm colors and camera shots that evoke emotional isolation for children. I was especially impressed with the screenplay of Kelly Marcel and Sue Smith, who between them do not have any credits suggesting that they could accomplish what they have done here. This is a story that turns dark occasionally and the mixture of the light and dark are matched very effectively. 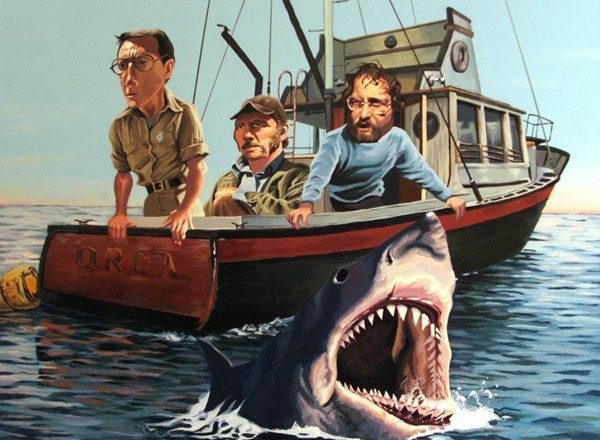 Hanks and Thompson are both well served in the last third of the film, when the pieces start to form a more complete picture and allow us to see the complexity behind then difficulty of the characters. I don’t know if Walt would have approved of his monologue to travers as he reveals his ability to identify with her, but Hanks sells it and it is very nicely written. Maybe the best teaser poster of the year. I have never made it a secret from any of my readers that I am a sentimentalist. The idea of this movie is enough to bring a tear to my eye. In the last twenty minutes I gave over to it completely and I am not ashamed to say that my face would have been soaked if not for the discrete presence of a handkerchief in my hand. This movie did for me exactly what I wanted it to, it intrigued me, entertained me and moved me. While it may have done so at times with a heavy hand, I frankly don’t care. Leaving a film with indifferent emotions and only an intellectual experience is not a goal I seek from films. I like when my brain is stimulated, but I also like when my heartstrings are pulled. This movie did enough of the former not to be insulting, and enough of the later for me to treasure it.